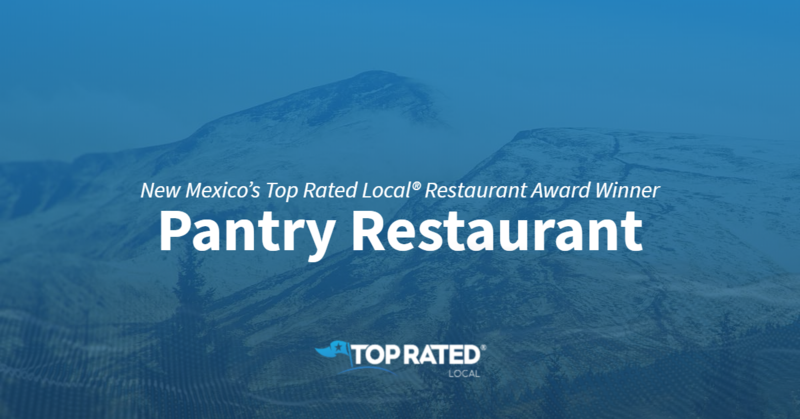 Top Rated Local® is pleased to announce that Pantry Restaurant is a 2019 award winner! “Extremely excellent food! I highly recommend the standard lunch and dinner platters and the morning breakfast burritos! My husband and I loved them both and the waiter was both accommodating and informative on all the possible options and his advice on what to get did not fail! I cannot possibly recommend this place more! Dine often! Dine constantly. You won’t be disappointed with this local favorite. We asked around before going and let me tell you 1200 good reviews will not steer you wrong! !” -Rebecca K.
“While visiting Santa Fe we were in need of a good authentic breakfast. Pantry Restaurant did not disappoint! Upon arrival the parking lot was full- one review indicated to get there early and that’s accurate. We got a seat quickly and our server made a few recommendations. One breakfast burrito and one chile relleno omelette, both Christmas (red and green sauce). I don’t typically like red sauce but tried it out and was glad I did! It was full of flavor and a little bit of spice! I also don’t like breakfast potatoes but these were so well seasoned, I ate them up! The biscuits and gravy were a side and also delicious. We’ll be back when we’re in town again!” -Regina S.
We spoke with Michael Singley, the owner of Pantry Restaurant, about the business’ impressive online reputation. So, what’s Michael’s advice to other businesses working on their online reputation? Congratulations to the team at The Pantry for being a 2019 Top Rated Local award winner, and thank you so much, Michael, for taking the time to speak with us!